The child of a 'Block' construct can be assigned in the 'Block Definition Diagram' via drag-and-drop. Both the "to-be" parent and child 'Block' constructs must be added to the diagram first before the parent can be assigned. 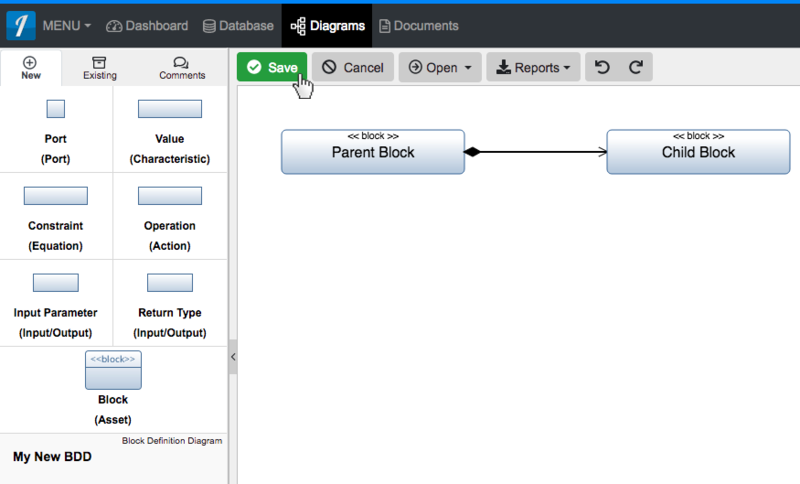 Within a 'Block Definition Diagram,' select the child 'Block' of which you would like to assign the parent. Drag the green circle over to the parent 'Block' of your choice. When the parent 'Block' box highlights green, release the left mouse button over the 'Composition (decomposed by)' section to add a decomposes/decomposed by relationship. Once added to the diagram, the new relationship should appear as an arrow between the two 'Block' constructs. Click the 'Save' button located on the toolbar to persist your changes to your project's database. The child of a ‘Block’ construct can be assigned in the ‘Block Definition Diagram‘ via drag-and-drop. Both the “to-be” parent and child ‘Block’ constructs must be added to the diagram first before the parent can be assigned. Within a ‘Block Definition Diagram,’ select the child ‘Block’ of which you would like to assign the parent. Drag the green circle over to the parent ‘Block’ of your choice. When the parent ‘Block’ box highlights green, release the left mouse button over the ‘Composition (decomposed by)’ section to add a decomposes/decomposed by relationship. Once added to the diagram, the new relationship should appear as an arrow between the two ‘Block’ constructs. Click the ‘Save’ button located on the toolbar to persist your changes to your project’s database.